After NYC, the booklaunch and the online book party, there was still work to do! 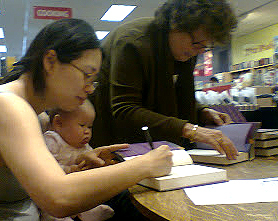 Wonderful readers from all over had ordered books from Porter Square Books, so Rain Dragon and I (with good friend Libby) returned to sign them. All 110 of them. Needless to say, after the first 50, Rain Dragon got a little antsy in the stroller and I was soon signing with her in my lap. I was absolutely thrilled to be signing the books and so grateful to everyone who ordered, but it was a tricky juggling act. I realize that this is symbolic of my life from now on. As I look ahead to the new house, new events and new books (hopefully), I can already see the complications. When I wrote Starry River of the Sky, it was a consuming process and it was purposefully so. I wanted to create a book to the best of my ability, dedicating all my time, focus and passion into it. I don't know if I can do that now, yet, I worry that the quality of my work will suffer as a result. I've gotten used to focusing on one project at a time. But, I guess I will just have to learn to multitask. And, of course, I wouldn't want it any other way...but would welcome any tips or suggestions on how!